San Diego Comic-Con carried with it a slew of new Magic information as well as the return of the mixed-reception black-on-black Planeswalkers. Today we’re going to look at what came out of the event and see what we can piece together about the near future. Jared spoke at length about this Monday, so I’ll keep this short. Wizards stepped it up a bit this year, as it comes with six walkers instead of five (due to multicolor Garruk’s presence). They even tossed in a Nerf Garruk’s Axe as well. Last year these promos mostly flew under the radar until it started leaking from the con floor that nearly all had been sold on Friday and that they may be unavailable Saturday and Sunday. Prices doubled and tripled on eBay within a few hours. This time around the set of walkers was a known quantity though, and the market was prepared. Sets hit eBay for $500-$700 initially in an attempt to cash in on the fervor of last year. The prices have since settled and it looks like they’re finishing under $400 right now on eBay. I’d expect we’ll see the floor on these within one to three weeks before a very gradual rise. If you want a set(s), start keeping an eye on completed eBay listings now. Like most of this type of product, it will be guaranteed to rise over the long term, but I can’t promise there aren’t faster ways to make money. I’ll personally probably grab a set so that I have it, but that may be about it. It is worth considering that this year’s crop of Planeswalkers is much better than last years. Liliana Vess has had strong casual demand for years, Nissa and to a lesser extent Jace could end up being Standard playable, and Garruk will definitely be popular in the long term. 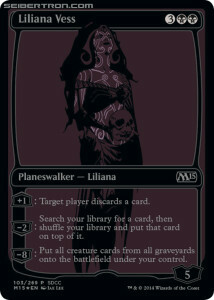 Originally Liliana of the Veil was slated for M15, but they pulled her for power level concerns. Can you imagine what the SDCC version of that would have gone for in a few years? The Magic panel was mostly about Khans of Tarkir and its prerelease, with additional info FTV:Annihilation, a new Duel Decks anthology, the Speed vs Cunning Duel deck, and Commander 2014. Let’s start small. FTV:Annihilation is confirmed to have Armageddon, Wrath of God, Living Death, Rolling Earthquake and Cataclysm. Armageddon, Wrath and Living Death are mostly uninteresting. This will be the first foil printing of Cataclysm, so it should do pretty well. It may end up being the 2nd or 3rd most valuable card in the box. Rolling Earthquake is the big ticket item here. English P3K versions are going for $150 at the moment. The printing here will probably pull that down a fair bit. We have two good prior comparisons: Loyal Retainers and Imperial Recruiter. Loyal Retainers used to be nearly $150 just two years ago when Commander’s Arsenal was released. Today, P3K versions can easily be found for $50. Imperial Recruiter hung around $280-$350 prior to the judge printing, and it seems like it’s still in that territory. The judge copy is a bit under $200 right now. Why did Loyal Retainers drop so much when Imperial Recruiter held most of it’s value? I would guess it’s mostly due to playability. Retainers are only barely played in Legacy and not much elsewhere. Recruiters continue to show up in Legacy, albeit in more fringe lists. I’d also hazard a guess that Retainers show up in EDH and Cube a fair bit more, but that’s purely speculative. Regardless, the demand for Imperial Recruiters has prevented the P3K price from crashing like it did for Recruiters. The question is whether Rolling Earthquake is an Imperial Recruiter or a Loyal Retainer. My guess is that it will behave much more like Loyal Retainer. The only people looking for Rolling Earthquake are guys with cubes and maybe a few EDH players here and there. Overall, there just aren’t that many people who need the card. This influx of copies won’t completely decimate the price, but I’m guessing that it will drop a fair bit, although it won’t happen overnight. If you’ve got copies you don’t especially need at the moment I’d probably ship them. If the price does drop you can reacquire for much cheaper in a year. If it doesn’t drop, you can just rebuy at the same price you sold it for down the road. Moving on, we’re getting a Duel Deck Anthology in December. It will be a reprint of the four original Duel Decks: Elves vs Goblins, Jace vs Chandra, Divine vs Demonic and Garruk vs Liliana. This is an overall win for most players and shouldn’t harm holders of the original sealed product much at all. It specifically says the reprints are in new frames, so the original sets will clearly be different. People holding the original sealed product won’t be harmed because those will still be the original run, while these will be a re-release that just won’t be the same. Imagine if they reprinted Superman #1. Even if they printed hundreds of thousands of them, the original’s price wouldn’t be touched. It will be no different here. As far as singles go, it’s hard to say. We don’t know what the distribution on these is going to be. I’d guess it will have a mild impact on the best singles, but it shouldn’t be too severe. I doubt these anthologies are going to be print-on-demand the way the latest Commander batch has been. 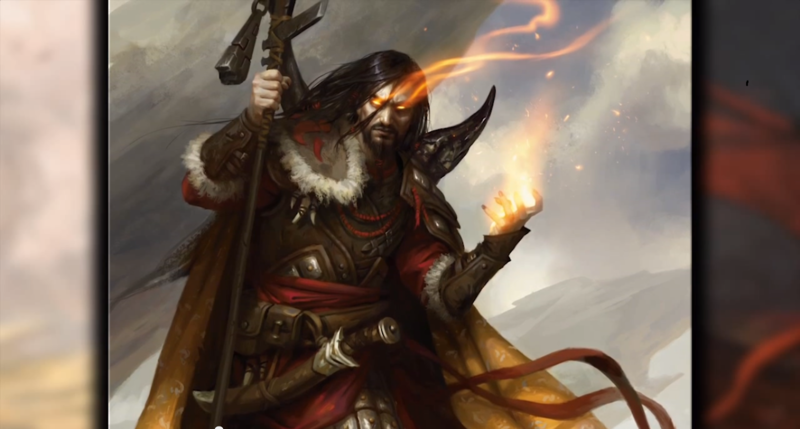 Commander 2014 has some exciting new Planeswalkers for us. The one spoiled is Teferi, Temporal Archmage. I’ve long talked/hoped to see old characters reprinted as Planeswalkers in additional product, and it’s great to see it come to fruition. The two big twists for Teferi are that he (and his cycle) can be your commander, and Teferi specifically grants you an emblem that allows Planeswalker abilities to be used as instants. This idea certainly isn’t new. It’s definitely cool to see, although I don’t see it Teferi specifically making a splash in any formats. If he let you use the abilities as instants right out of the box it would be one thing, but given that you only receive that privilege with the emblem, I think Teferi will be relegated to the 99 card realm. The rest of the product should be nifty, and I’m curious to see who they release as the Planeswalker commanders and the cycle of old legendary creatures that never saw a card. The sealed product itself shouldn’t be brutally expensive, as Wizards has learned their lesson on distribution caps for casual product. However be aware that this release is probably too soon after last year’s Commander product for them to have fixed any True-Name Nemeses. As for Khans, we got a decent sized dump of information. Khans is indeed the counterpart to Alara, being a shard set with official names for combinations like RUG and BUG. (The new names are not nearly as good as the Alara ones, by the way.) They made a point to say that Khans is a shard set, not a shard block though. If only a single set in the block is a sharded, I’m left wondering if we will see a tri-color land at all. It’s entirely possible we finish the Alara triland cycle at uncommon and see a more normal set of dual lands. I’m thinking that whatever they are, they won’t be come-into-play-tapped (CIPT) lands. The temples already force you to play the land tapped, and if the Khans land cycle does it as well, that has implications for the Standard format. I’d guess we may see something that gives you an option, akin to the Ravnica duals or the M10 checklands. Maybe we’ll finally get part of the Future Sight cycle? A Grove of the Burnwillows cycle would be an interesting complement to the painlands of M15. Two things I do see this does ruling out is manlands and fetchlands. The manlands because of the CIPT, and the fetchlands because there is simply not going to be enough support for them. Each clan has it’s own mechanic, with morph being the sixth mechanic. (We’ll get to morph in a minute.) The last time we had fetchlands landfall was the predominant mechanic in the set. With five clan-specific mechanics, how are they going to make fetchlands matter as much as they should? The answer is that they can’t. When fetches come back they’re probably going to be alongside landfall, and there simply isn’t enough room for it here. Speaking of mechanics, what are we getting? First of all, morph is confirmed to be returning. That’s a bit surprising, as I get the impression morph wasn’t all that popular the first time around. I’ve heard tales of how much Zombie Cutthroat ruined draft, so don’t expect any free morphing to show up. Most of the morph cards from days past are tribal, as a good majority of them showed up in Onslaught block. That limits how many reprints we’ll see. Flipping through all cards with morph, there are two that catch my eye. The first, and potentially more lucrative reprint, is Birchlore Ranger. It’s a relatively unassuming common elf. A 1/1 for one that gives you a mana if you tap two elves. Seems unimpressive, right? The hook here is that Modern elves would kill for this card. Having access to Birchlore Ranger means Modern elves can play things like Beck without bending over backwards to accommodate it with mana. It also gives them access to all sorts of important off-color spells that will fill holes from other missing Legacy cards. If Birchlore is reprinted, expect Modern elves to become a lot more relevant. In this scenario Beck is a good choice, but we can go deeper. Cloudstone Curio may be what we want, perhaps Craterhoof Behemoth, or quite possibly something I’m not even aware of. In the event that Birchlore shows up again, start watching Modern elves lists like a hawk. A second, less exciting reprint would be Exalted Angel. Exalted Angel won a Pro Tour I believe, and even if she didn’t, she definitely made her mark on Standard back in the day. A reprint would jack up the pack foil for sure, and possibly the judge foil if the art is different this time around. What else will we see out of Khans mechanics? Delve is a reasonable safe bet. According to this tweet from the panel, the Sultai (BUG) is a resource manipulation mechanic. That can mean a lot of things, but one of them is certainly delve. There are only three cards in Magic’s history with the keyword already, and only one relevant one: Tombstalker. If Tombstalker is reprinted, does he rocket in value? Not necessarily. The Modern Masters edition would certainly take a hit, as the any new printing will have the same border. Only the Future Sight edition would stand to gain. It may jump a bit if he’s spoiled, but I’m not convinced he’ll make enough of a mark on Standard to matter. He’s already legal in Modern and sees no play there, so the only place this reprint will matter is Standard. Once Ravnica rotates we are not going to have much left in the way of graveyard support. Sure he can be a 2 mana 5/5, but does that matter enough on turn six or seven? It’s possible that the rest of the Sultai cards will have some graveyard support, but I’m hesitant to say that Tombstalker will be strong enough. Considering the FUT foils are $20+ already, this seems easy to stay away from. Another Khans piece of info is that the prerelease will not have five promos, but forty. Each color will have eight options. For example, if you’re playing green at the prerelease, you get to choose between Overcosted Hydra, Weak Hydra, Situationally Relevant Hydra, Giant Growth Hydra, and four other hydras. Assuming distribution is similar to past prerelease promos, this will serve to suppress the price on forty different rares instead of five. There were fifty-three rares in Theros, which means only about thirteen Khans rares will be potentially financially relevant. This doesn’t feel like too much of a departure from the norm, but now the cards we should care about are much more clear. If 75% of the rares in the set are promos, only 25% have a chance to really climb. What’s most interesting about this is if this is a plan they intend to continue implementing. Born of the Gods and Journey Into Nyx only have thirty-five rares. Are they adding five rares to the small sets to keep up with the forty promos? Does that mean every rare will have a promo? They can’t all have alternate art, right? This will be pretty important down the road, but for now we simply don’t have much info. One point that sort of slipped under the radar of most coverage is that the winter and spring set’s release dates have been moved. Apparently, the winter set will hit in January and the spring set will be releasing in March. For reference, Journey into Nyx was released May 2nd. Even if “Louie” hits the last Friday in March, the 27th, it’s still a solid five weeks earlier than JOU, and there will only be six or seven weeks between the winter and spring sets. That’s a rather breakneck release schedule after the first of the year. My guess is that the reasoning behind this is to put a little room between the “Louie” and a large announcement next summer; possibly Modern Masters 2. There was only a month between the original Modern Masters and Dragon’s Maze. MM stole most of DGM’s thunder, especially since the Modern reprints were so much more exciting than most of what DGM had in store. I’m not exactly sure what impact this will have on Khans block singles at this point. We’ll figure that out at a later date. Moving the spring set back a month and a half really sets up a big product in early summer. If it’s not another Modern Masters, it’s sure to be something exciting. There certainly was a lot to cover this year, and I don’t doubt that I missed parts of it too. If I missed something you want to discuss, plop it in the comments. Loyal Retainers – At the time this is posted, this card is banned in duel commander. Cataclysm – Also banned in duel commander. Major taboo in regular commander. Rolling Earthquake – I foresee this card having mainly virtual value. Teferi, Temporal Archmage – I predict this card is going to be a house in duel commander. Those decks like to throw tons of micro control spells early game, but this card allows you to play it and keep your shields up (untapping 4 lands) while +1 for superdraws for the rest of the match. Being banned in duel commander is going to have virtually no effect on the price. I’d suggest the allied painlands, but then I realised that some have Dominarian names. While there are only 35 rares in a small set, you also have a chance of 5 mythics, one for each color/tribe/etc. 35 + 5 = 40, so that math works out to 40 prerelease rares. They do, however, only print 1/8 the number of prerelease rares per rare compared to the current situation. If they rares are good enough, they could still spike, I think? I don’t think you get to choose your promo. You get to choose your color/tribe/etc, and get a playable rare/mythic of that tribe in your prerelease pack. I don’t even know if they continue with the tribe packs, they could even go with six normal boosters + playable promo (read: 7th rare in your pool). The on-color pack of the M15 prerelease already contained a slightly skewed distribution to your chose color. Grove of the Burnwillows, and a cycle surrounding it, will likely never see Standard again. It’s far too strong a land for control strategies, and nearly completely useless for aggressive strategies. A standard with Scrylands and Grovelands would be glacially slow, and pretty much any aggressive R/x strategy would be nonexistant. On the subject of Morph reprints, Exalted Angel is an impossibility without errata. He life gain ability has been made obsolete by Lifelink, and they are not likely to errata past abilities. Rather, they may make a functional reprint of the card (See: Armadillo Cloak and Unflinching Courage). A direct reprint, however, is horribly unlikely. Finally, I think you are missing perhaps the biggest elephant in the room when considering morph reprints: Bane of the Living. It was heavily played in its last standard run, has an ability that black wants, easily fits the theme of any plane, and while being strong in current standard sets isn’t oppressively so. It’s probably the best possible reprint option for the mechanic. It’s not an expensive card at all, so it’s less assuming for a spec target, but if it makes its way into standard I could see it being worth something.